Things are looking better for my bathroom project. So the other day I shared my frustrations about my bathroom renovation problems. It is hard to do a big project and not have some problems along the way. I happy to say the problems/frustrations have been resolved and the bathroom work is getting done with just a couple days delay. The tile store was able to locate some of the black tile that we needed and the worker was able to get in in a couple days. They had to order some more of the black tile and I was informed that the tile would arrive by Friday so that they work would be completed on Friday. So the next day the tile guy came back to work on the shower with what tile he had. He just needed a couple of black tiles to do the border in the shower but he was able to do most of the tile and the floor of the shower that day. The next day he was able to lay the black tiles on the floor with what tile he had, as he was still waiting on about 15 black tiles. The tile guy placed the tiles on the floor and only was short eight tiles. I loved that he left the missing tiles in the middle of the room so that meant the areas that we were to place items on were completed so my husband would be able to do his work on Saturday. The tile guy will be back on Friday to place the eight remaining tiles and their work will be done. So I am relieved that the project was only delayed a couple of days. This weekend my husband and teen will be installing the shower doors, vanity, vanity top, faucets, and toilet. We have a friend doing the baseboards for us and I am hoping that he will be able to join us this weekend. We are doing the baseboards in a turquoise color. So my friend will cut the wood and I will paint them. My friend will also install the baseboards as he has a nail gun. So I am excited that my bathroom might be completed by Sunday evening! Then my fun begins! I get to place all the items back in the new vanity cabinets and drawers. I can't wait to get all the clutter out of my bathroom and dining room. I bought a fancy bookshelf for the space where the shower use to be and I will be decorating it with baskets and containers. My goal is to tastefully organize items like towels, toilet paper, soap, and other items on this bookshelf. It will be fun doing this. 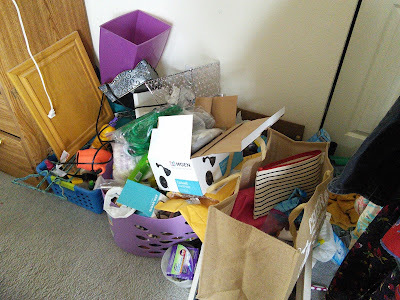 I already have a lot of the baskets and containers that I want to use. 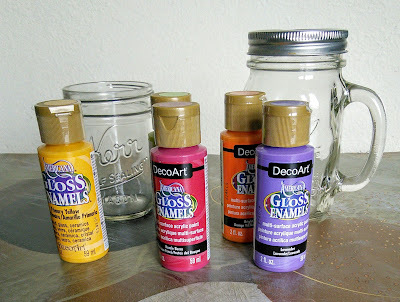 I also bought some paint to decorate mason jars so that I can put smaller items in these. If my painting the mason jar project succeeds, I will write about the process. So here is what the bathroom looks like now. Once my husband gets the other items in there and I decorate I will then show more pictures. I can't wait to take a shower in my new shower. My boys are already begging to use my shower. I might let them but I think it involves extra chores. Oh, I also have to get a space heater as this room is quite big and needs to be heated in the morning when my husband takes a shower. I want to buy a heater that will heat the space quickly so that the room is warm when my husband finishes his shower. I would love suggestions if you have a space heater that works great. 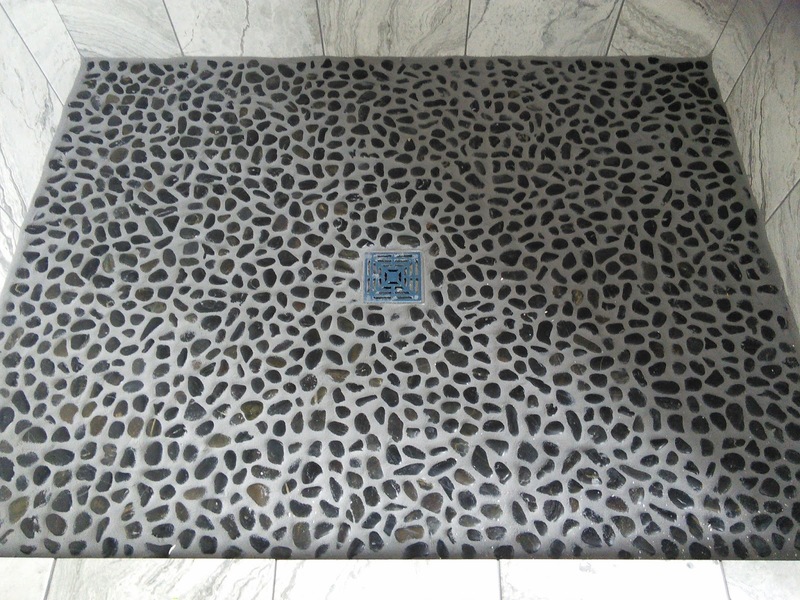 I just love the stones on our shower floor. The grout still has to be washed so I am hoping that the stones will be more pronounced then. Renovations are so exciting! I like the stones, too and the color of those tiles. Good luck with the project, can't wait to see the final results. I love the tile color and the stones are really cool on the shower floor! Nice you have a friend that's helping and it will be completed soon! Looks gorgeous! Happy to see the progress. Looks much good now. Hope you get it completed soon. Good luck with it all! We'll be doing this at some point. I love those stones. 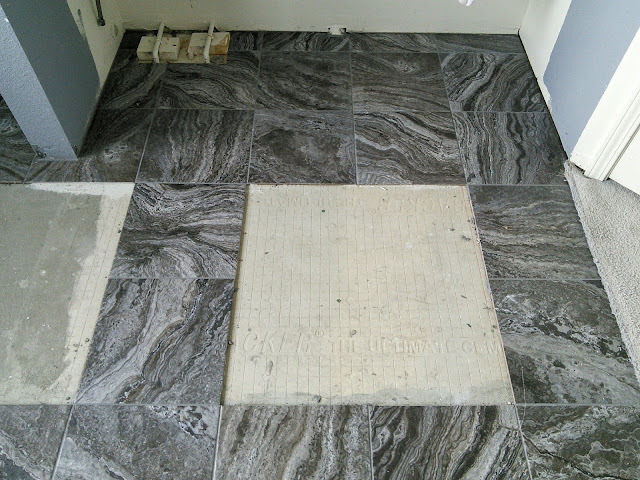 That was a great shower floor, seems like you are having a shower on a Beach style bathroom and I cannot wait to see its finishing. I love the colour scheme of your shower cubicle. The stones are a cool idea, will they be massaging your feet while you're in there?! Wow! I love the color and the pattern of your bathroom tiles! It looks so neat. I also love those stones! I can't wait to see your bathroom project take place and the turquoise sounds lush! I am glad things are on the move now! I love this flooring! it looks so relaxing! Great choise ;) "MaryAnne"
Glad to know all about this and I like the stones:) The bathroom project is pretty cool really. Wish you luck with it! I love how the floor turned out. I bet it feels good on your feet. Those tiles are beautiful. And I bet renovating is a lot of fun. I'm so glad that you are finally getting your bathroom renovations done! 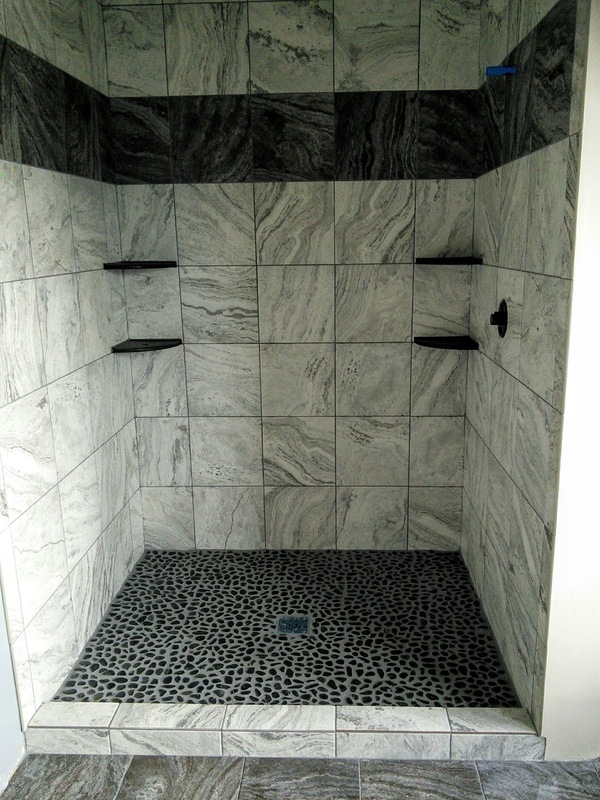 Love the shower floor you chose! I do like the way the tiles look so far. The stones look really nice too! Definitely good design choices. Omg loving what you have done!!! That floor of the shower is pretty epic!!! Good to know that you guys are now doing the best you can to make up for what happened a few days ago. It's nice to see your family working together to fix your bathroom, that's so awesome! Im glad you are getting this resolved. I felt the frustration in your last post but delay is not denial! Cant wait to see the finalization of this! Love your bathroom tiles, it is simply classy. I've been wanting to use black tiles too, but I can't win over with my family. I would love to own my own home so I could renovate. I love your style and especially the stones on your shower floor. It looks great! We recently renovated our bathroom and it was a pain! We replaced the flooring and everything. I don't ever wish to do it again but if I did I would do a tile backdrop. I really like the way it looks and the stone floor is lovely as well. How does it feel on your feet though? My hubby and I both have very sensitive feet.